Cowsmo, Inc. is a business associated with Rosenholm Dairy, a partnership owned by John and Nettie Rosenow. John is a fifth generation farmer on the same land on which his great-great-grandparents settled when they immigrated from Germany. His great grandfather, also John Rosenow, had six sons and three of those became farmers, including his grandfather, Louis. Incidentally, another son became a doctor and joined the original Mayo Brothers in Rochester, Minnesota as a researcher. The three sons farmed next to one another, and their sons took over their respective farms. John’s father, Jacob, took over the original homestead farm, and eventually purchased one of his cousin’s adjacent properties as well. In 1972, John and his wife Nettie graduated from college and began farming with John’s parents in Waumandee. In 1989 a massive fire destroyed the main dairy barn, causing the Rosenows to rebuild and move in a new direction. Among the changes was the addition of a composting facility to manage the manure generated on the dairy. 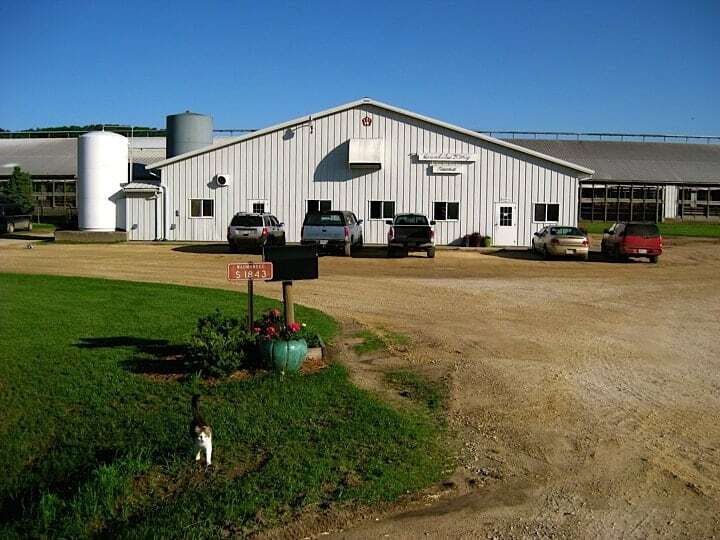 In 1997, the Rosenows merged with a family that had been their neighbors for 70 years to form a partnership called Rosenholm-Wolfe Dairy. The focus on composting became more serious at this point, and a two acre hard-surface site was built, a compost turner was purchased, and they began monitoring windrow temperatures in order to create high quality compost which they began to call Cowsmo. In 2001, garden centers began carrying the compost, and a loyal following of satisfied customers developed. These customers shared the positive results with their friends, and sales have grown steadily since then. In 2005, a third acre of hard surface was added to the compost site, and a larger compost turner was purchased. These changes increased the compost production capacity from 3000 to 8000 cubic yards per year. In 2006, Cowsmo Incorporated was created as a continuation of the compost business and was owned by Nettie Rosenow, John Rosenow and Loren Wolfe. With the encouragement and expertise of local CSA grower, Heather Secrist, Cowsmo began mixing compost-based potting soils in order to provide a local alternative for organic growers who had been importing their potting soils from the Northeastern United States. Since then, potting mix sales have grown as more Midwestern growers, such as River Root Farm, Featherstone Fruits and Vegetables and Heritage Prairie Market, chose to buy local.